Have you ever received a sudden onslaught of spam and wondered where it came from? 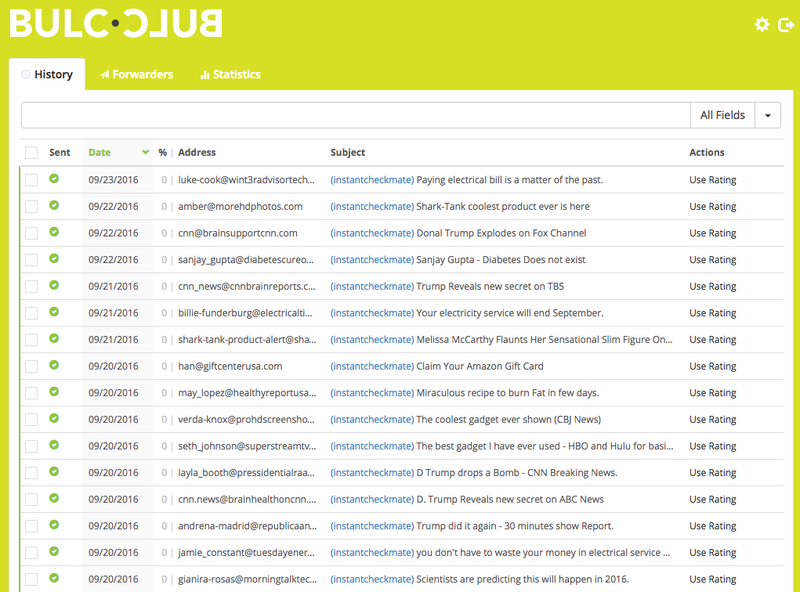 Bulc Club Statistics make it easy for you to identify who sold your email address and block their spam instantly, with the flip of a switch. While researching for this case study, we pored through hundreds of emails we’ve received from online services. We found a contest that surreptitiously sold our Bulc Club email address to a number of vendors. We found an online jobs list that shared our information with a handful of third parties. But when we looked into Instant Checkmate—mentioned briefly in our Spam Watchdog article—we found the ideal example for a case study on identifying and blocking a spammer. Instant Checkmate is one of a number of online background records searches created by The Control Group, of San Diego, California. They boast about making the world safer for potential employers, online daters, and parents of teenagers. But what they don’t mention is the safety and security of your personal information and how they sell/share your email address once you provide it to their service. 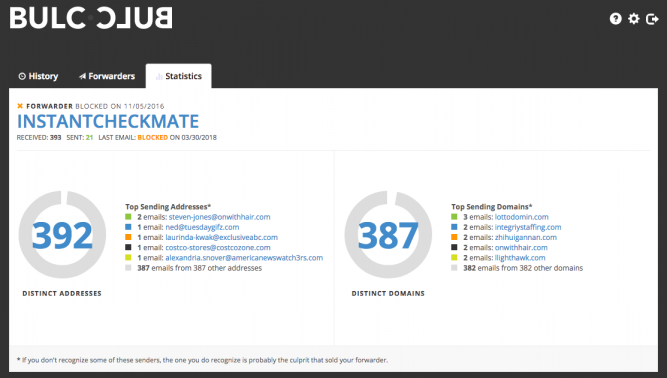 All of the spam we received came from different email addresses and different domains. It is clear that despite the good they tout on their homepage, a large part of their business model is unethical and dangerous to their users. 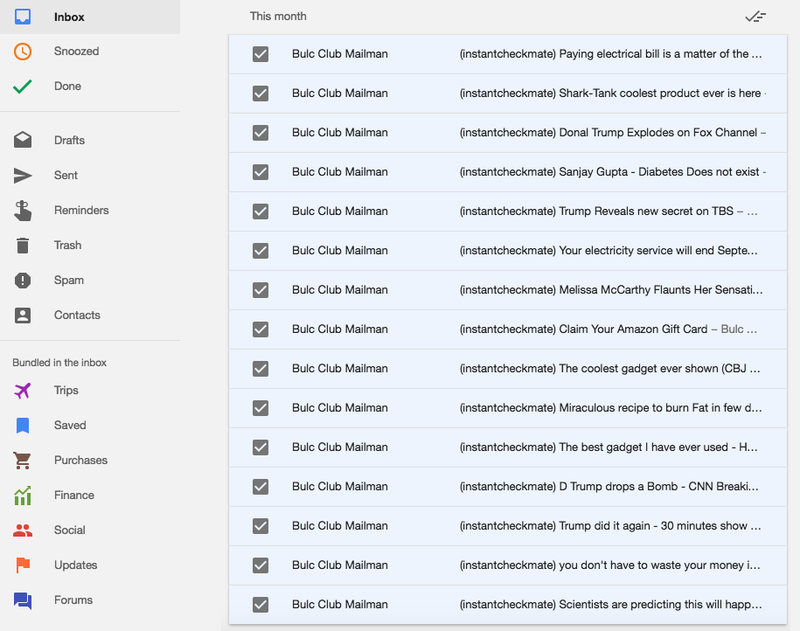 If we provided Instant Checkmate with our actual email address, it would be nearly impossible to block all messages we received from these spammers. 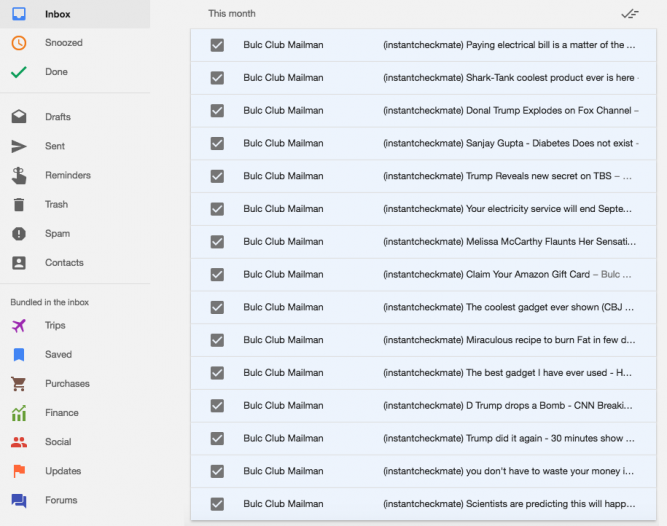 We could drag one message to our spam folder, or block another email address in our spam filter, but dozens of others would still slip through. Traditional spam blocking methods would be laborious and ineffective. Bulc Club users never provide their real email address to any online service. They simply create a new forwarder (e.g., InstantCheckmate@jsmith.bulc.club) and that’s the address that Instant Checkmate sells. 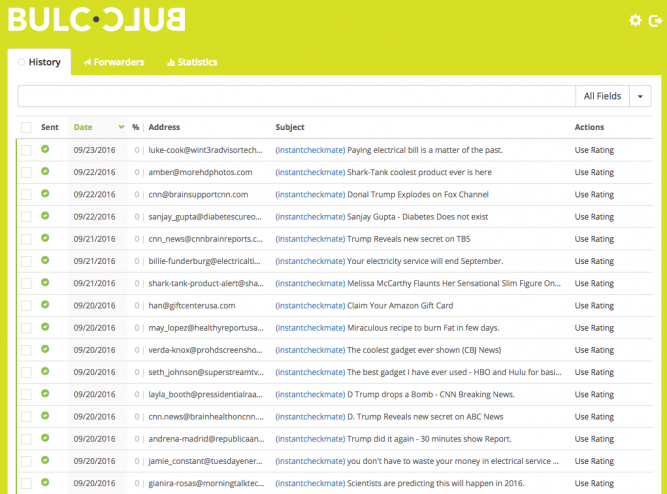 From the History tab of the Bulc Club Member Console, users can see a list of all messages received through this forwarder and block the spam senders’ addresses and domains individually. Or, if they don’t want to receive any mail through this forwarder again, they click “Block All” from the actions dropdown next to it on the Forwarders tab. Instantly, all Instant Checkmate spam and bulkmail is blocked, leaving their inboxes clean and protected. Give it a try, yourself. Use a Bulc Club forwarder when you subscribe to any online service and you’ll be glad you protected your email address. If after reading this case study, you still want to try Instant Checkmate, join Bulc Club first (it’s absolutely free). Prospective employers, online daters, and concerned parents can still use their background checks. The Control Group can still sell your forwarder. And third parties can still send their spam. The only difference is that you’ll receive nothing. Note: Naturally, we would’ve blocked mail from this forwarder immediately, but we allowed it for the purpose of this case study.